You may have read in the AUC Newsletter last year about some amazing custom symbols you can use as a proofreader for editing purposes. These free stamps are great, but did you know that Acrobat (and the free Reader) has a built-in proofing tool? Located under the View menu, this tool is called Read Out Loud. That’s right, listening to a PDF out loud can help you to proofread a document. First, you’ll need to activate Read Out Loud using the menu command View > Read Out Loud > Activate Read Out Loud. Next, choose, View > Read Out Loud > Read This Page Only or Read To End Of Document. Notice also that you can use keyboard shortcuts to perform these commands. 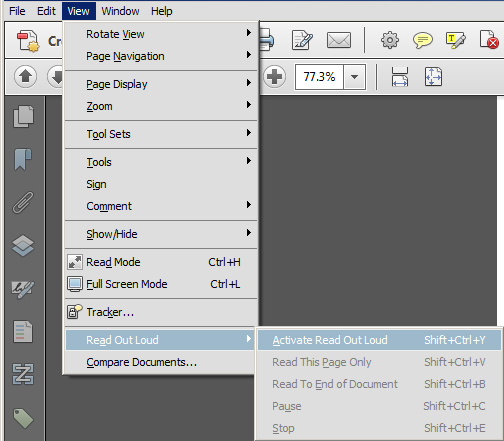 The Read Out Loud feature will actually read aloud the text in a PDF using the available voices installed on your computer system. If you want to manually move through various paragraphs of your PDF using Read Out Loud, then you can use the Select Tool to do this. With Read Out Loud still turned on, click on the Select Tool in the toolbar. This will allow you to move to a precise location in the PDF and use the keyboard arrow keys or mouse to navigate. Once you’re done using Read Out Loud, you can turn it off using the View > Read Out Loud > Deactivate Read Out Loud command. There are a few options that you can set for Read Out Loud under Edit > Preferences > Reading (Windows) or Acrobat > Preferences > Reading (Mac). You can set the Reading order, volume, voice – remember that voice availability is dependent on the voices available on your operating system. You can also set speech attributes like the pitch and speed. And, finally form fields, which allows Acrobat to read the state of selected check boxes and radio buttons in addition to any text that may be in a form field. So next time you need a quick and easy way to proof a PDF, look no further than the built-in tools found in Acrobat or the free Adobe Reader. I’ve also covered this in detail during the Using Read Mode/Read Out Loud session for Learn Acrobat XI on Udemy.com.